Get attention. Get interviewed. Get known. In the course of building your author platform, you send out all kinds of communications: blog entries, social media posts, email newsletters, and more. Every one of these messages is an opportunity to connect, engage, and build relationships with influencers, peers, and your future readers. These are how you can build a community. So often, authors only post updates that are self-promotional. But you can’t build a “community” by haranguing people to buy your book. If you keep yammering about yourself and your book, the audience will just tune you out. Over-promoting yourself and your book will drive away followers and may even ruin your platform. Focus on providing valuable content—your own content as well as content you curate and share from other relevant sources. Post the kind of content that other people will like and share with their friends. Strive for creating meaningful connections with influencers, peers, and readers. Your focus should be on the needs and wants and interests of your target readers. Instead of always begging for something from them, offer something of value to them. The key is to give more than you ask. A great rule of thumb is for 80-percent of your messages to cater to the needs and interests of your target audience. Then—after you’ve earned it—the remaining 20-percent of your posts can toot your own horn. But what are those messages? What do you blog about? What do you talk about on social media? What do you post on Facebook and Twitter and Google+? What do you share with your email list? In this article, I’ll share the five distinct kinds of messages that you can share with people—all of which build your brand, prove that you’re the go-to expert, and draw them closer to you as a person. Then, when you get around to saying, “By the way, I have a book,” you’ve already laid the groundwork. 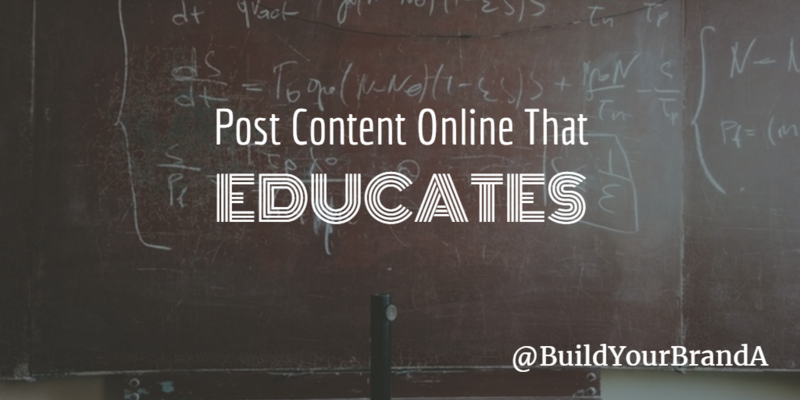 The first type of post is educational, so that your audience can see your expertise in action. The members of the audience should learn something—maybe a certain set of facts, or steps to reach a particular goal, or how to accomplish a particular task. Whether you write how-to books or westerns or anything else, you have an above-average level of knowledge about your field. The act of writing your book—working out your thoughts, researching the facts, living through those experiences—whatever was inside of you that’s now inside that book, that makes you an “expert.” You have information your ideal readers will find valuable or interesting. As you share valuable, relevant content, your target readers will want more. As this becomes a habit, you begin attracting the kind of people who’d also be interested in your books. Share some piece of news. Teach a bit of history. Share about one of your peers. Teach some bit of wisdom. Explain how to do something. Share something you learned researching your book. Share a fact about the history of your field. Share a nugget of wisdom from your book. Share a tip or trick of the trade. Post quick video of you performing a demonstration. Share an image with an educational quote. If you’re a historical author, maybe you can educate readers interested in the era in which your stories take place. If you’re a cooking expert, you might educate your audience about tools they can use in the kitchen. Maybe you can offer a behind-the-scenes peek into your business. Encourage followers to look at something in a new way. 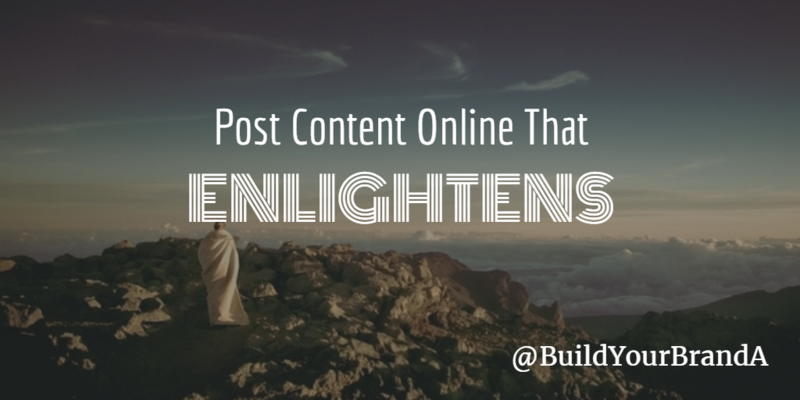 The second type of post is enlightening, so that your followers will see the world—and you—in a new light. Encourage them to think differently or to look at something in a new way. Share your unique perspective on a piece of relevant news. What can you add to the discussion from your unique vantage point? Share a motivational or inspirational quote. What would help your ideal readers to feel encouraged? Share a philosophical or religious point. How does your worldview match up with that of your ideal reader? Offer an alternative point of view. How can you provide some food for thought? Help your audience to look at something in a brand-new or different way. How can you provide your ideal readers with a fresh perspective? These are messages that you can create or curate where you inspire them to think differently, to see something from a different angle, or to challenge them to rethink some topic or issue. You can offer motivation, inspiration, or share something that gives your audience philosophical, or spiritual, or psychological enlightenment. How about an inspiring or motivating quote, video or photo? It can be as simple as sharing an article or blog about some positive event happening in your world. When you lift their spirits or help them see something in a fresh way, it will set you apart from other leaders in your space. Entertaining posts make it easier for followers to relate to you. The third type of post is one that entertains, so that your ideal readers will be drawn closer to you. The goal isn’t to teach or to make them think, but to touch your ideal readers in an emotional way. Studies have shown that sharing content that’s emotionally charged—especially when it’s happy or entertaining—is way more likely to be shared. Also, when you share something entertaining, it humanizes you and makes you more relatable. Tell an anecdote or story. Tell a joke or make a humorous observation. Share a human interest story. When in doubt, include kids or animals. They don’t all have to be about your topic or your sphere of expertise. However, the closer you circle that sphere, the more you can demonstrate that you have something special to say. Granted, you might be tempted to simply post pictures of kittens. But every author has a unique audience—if we’re both posting the same content and we have different audiences, that’s a sign that we’re not really serving our readers. 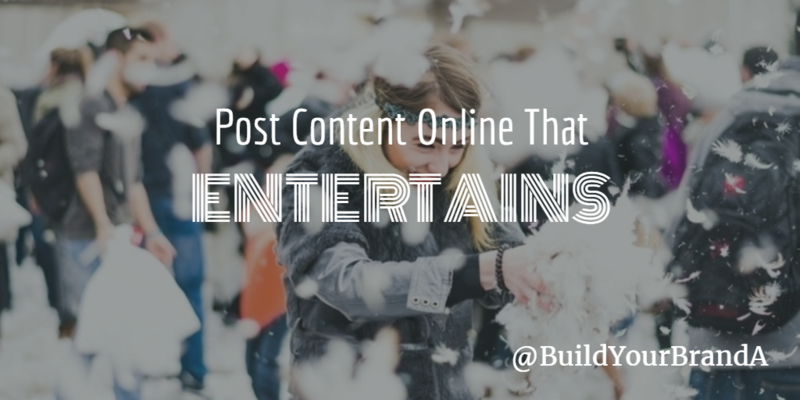 When considering an entertaining post, think how you can serve your ideal audience. You’re using these messages to create a bond with them. The real magic of social media is not broadcasting, but in conversation. The fourth kind of message is to post something that directly calls for engagement: Ask a question, provoke a reaction, or talk to people directly. This way you can enter into a dialogue with influencers, peers, and readers. Of course, every type of post can lead to some level of engagement with your readers. But here I’m suggesting that you push overtly for interaction. The real magic of the Internet is not in broadcasting, but in engaging in a conversation. There are a number of ways to encourage (or provoke!) interaction. Call out to individual followers personally. Ask for the worst ideas ever. Ask for the best ideas ever. They don’t reply. If this happens, don’t take it personally. Just come up with a different call to action and try again. They do reply. They may say good things, they may say relevant things, they may say off-topic things, they may disagree with you, or they may heckle you. If someone posts a helpful or positive comment, take a second to show your appreciation. People want to feel like they’ve been heard. If it’s a negative comment, take a step back to determine whether it’s a genuine dialogue taking place. If they’re being rude, you’re within your rights to delete the comment. However, if it’s an honest response with a different point of view, engaging with them may turn into an interesting discussion. 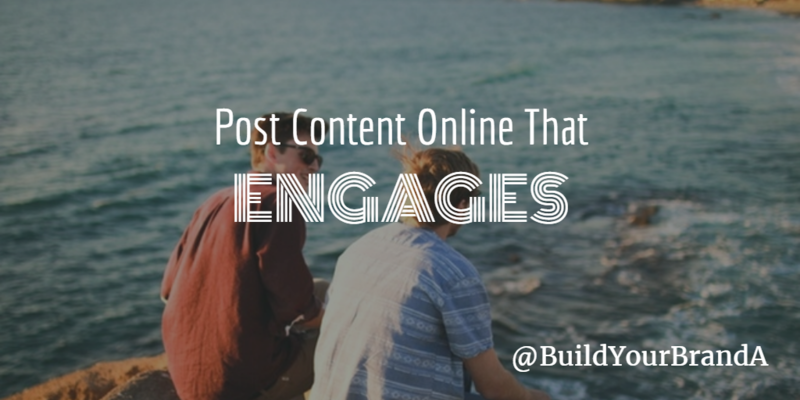 What does an engaging post look like? You can message a specific person or reply to a specific user. You can join a conversation in a comment thread. You can post an article that invites a debate. You can email your list a simple message asking your audience for feedback. When you stop broadcasting long enough to engage with users, you also begin to hear what they’re saying. You begin to learn what they want. As you get to know them—your readers become flesh-and-blood people, instead of simple numbers on a sheet of paper. Let's be real: The end game is to sell your books. For the fifth type of post, you get to—finally!—mention that you have a book. The key is to share a promotional message that’s creative and interesting, and isn’t off-putting. 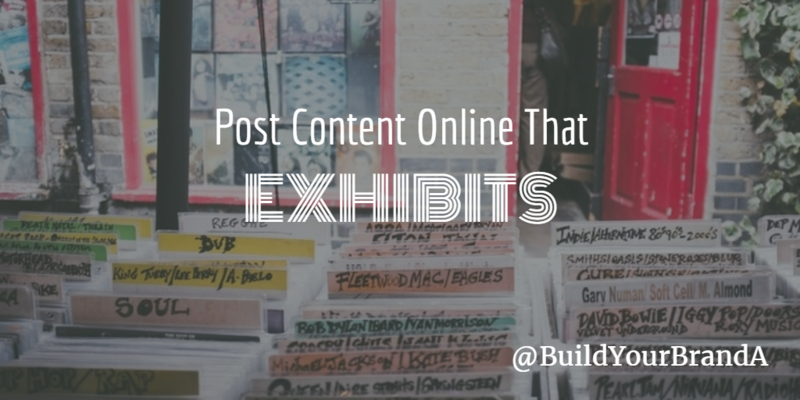 If you’re creating and curating and sharing these posts in the right spirit—building relationships; providing value; establishing your expertise; building trust—you’ve earned the right to mention your book. Your promotional message should be interesting and engaging. It should be educational or enlightening or entertaining. Share a behind-the-scenes anecdote or story. Make a list that includes your book. Start a conversation about your audience’s pain points, leading up to the mention that your book offers the solution. Link to an interview where you discuss your topic of expertise (and, presumably, the topic of your book). Quote a review of your book. Make a list of benefits that come with reading your book. Up to this point, you’ve been learning how to create messages that are interesting and relevant and that add value to the lives of your readers. Just because you’re going mention your book is no reason to throw all that out the window and become a jerk. When you craft your promotional message, it should be actual content. It needs to look and feel and read like all the messages you’ve been sending out up to this point. Your educational, enlightening, entertaining, and engaging posts should be connecting with your ideal readers. When you get around to mentioning your book, they should be interested. That way, when you say, “By the way, I have a book,” or “Hey, I was interviewed by this podcast,” or “Check it out—I was interviewed by this newspaper,” it’s no longer self-serving. It’s a natural part of this larger conversation that you’re already having with these people. Sign up for my newsletter and get a FREE download of the "Author Platform Blueprint." This PDF includes a media kit checklist, a book promotion planner, and even idea starters for your blog. Click HERE to get it! Join the Build Your Brand Academy Group on Facebook! Chris Well is an expert in media, social media, and email marketing. A media veteran with 30+ years experience working at national media brands, he has been a magazine editor, columnist, journalist, broadcaster, and teacher, with field experience covering music, publishing, human interest, and more. (There was also that time he was the editor of a bridal magazine.) Chris is also an experienced social media manager, and certified in email marketing. As a published novelist, Chris has written suspense and mysteries for traditional publishers and as a self-published author.